The Mad Gasser of Fullerton Strikes Again! Two members of the Ralph Ince Film Company returned to the California Hotel in Fullerton ’round midnight tonight to find their fearless leader, Ralph Ince, semiconscious and supine upon the floor. Nipping the ol’ Hollywood joy juice down in Valenciaville, eh, Ralphie? Why, no! He’s been the victim of the Mad Gasser of Fullerton! Hotel resident Carl Breusch said he’d seen a man skulking about the corridor, carrying a can, and that said can-carrier leapt out of a window when approached. Guests Charles Scott and Charles McMaster were awakened in their respective bedrooms by the odor of the anesthetic solvent and then espied through their windows a shadowy figure running down the street. 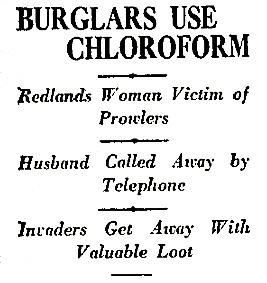 Though the papers reported Alois Sabinski’s recent battle with chloroform in his Nicholas Street home, California Hotel lessee Ellen Lincoln declared she’d heard nothing about any “chloroform burglar;” Fullerton Chief of Police T. K. Winter said, ahem, reports regarding any such character have been greatly exaggerated. In any event, Ince has departed for his company’s location in Santa Ana Canyon, and can not be reached for comment. Miss Madeline Lindsley was on her way home from a party when shortly before midnight, the pretty 19 year old encountered a man who abruptly grabbed her by the neck, and threw her violently to the pavement. The attack occurred in front of 434 Pacific Avenue, one block from the victim’s home and two blocks from police headquarters. Summoned by Madeline’s screams, four local men: H.K. Klingraef, 111 West Fifth Street; E.E. Peterson, 634 Cedar Avenue; Larry Moore, a Kress Store employee, and M.R. Hodges of 3117 Wilton Street rushed to her aid. 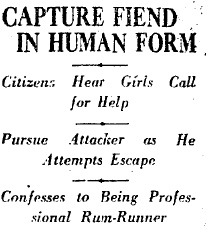 The girl’s cowardly assailant fled when he heard her rescuers approach. The posse gave chase through several streets and unlit alleyways until they nabbed their man. Neighbors telephoned police and the suspect was taken into custody by two detective sergeants, Wright and Dixon. “He acted like an insane man”, Miss Lindsley told police, following the ferocious assault. The accused, Mr. Walter S. Pawling, lives with his wife and two children. He confessed to police that he is employed as a professional rum runner, and told them that he had just completed a trip delivering illegal hooch from Catalina Island to San Pedro. Police discovered two ounces of chloroform and two eighteen inch lengths of rope concealed in Mr. Pawling’s pocket. Accustomed as they are to the various tools of illicit trades, even police were bewildered by his peculiar choice of equipment. Without missing a beat, Pawling glibly explained that he uses the chloroform and rope to defend himself against hijackers while on his late night coastal runs. Police were evidently so stunned by his story that they failed to request a demonstration of the weapons. Fleeing an angry mob or thwarting an attack by hijackers is a dangerous business, so Mr. Pawling may wish to reconsider the effectiveness of his arsenal. Packing a concealed bottle of chloroform and two flaccid lengths of rope is no way for a grown man to defend himself. In the future he might consider hurling a snappy bon mot, wielding a rapier-like wit, or brandishing a snub-nosed .38. Pity Miss Alice Chevallier, native of this city, who took too powerful a sleeping potion a few evenings past, and now lays rotting in her grave in New Calvary. She follows her mother and her brother, but unlike them, her death brings with it unwelcome notoriety. Alice was a longtime cashier at the Ville de Paris dry goods emporium on Broadway, between 2nd and 3rd Streets. At some stage in her career, she developed a system by which she could bring home with her a portion of the day’s receipts. In recent months, it is believed this was as much as $300 a day. A clever girl, she invested her takings in real estate, and built a handsome portfolio. But her ingrained nervousness and peculiar disposition–she did not care for men, and perhaps not coincidentally suffered ovarian tumors, neuralgia and insomnia–proved the thief’s undoing. She found it necessary to escape to Catalina to rest following an operation, although she must have realized that her absense from the place of her crimes would make discovery likely. And that is precisely what happened. 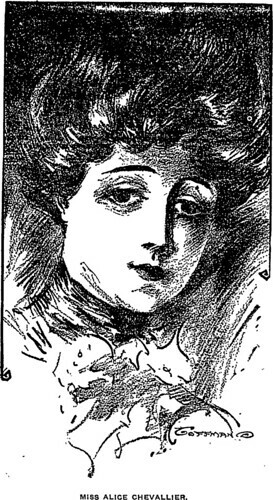 Alice returned to her home at 226 West Jefferson, distraught from a sustained bout of sleeplessness and the anxiety of meeting the Ville de Paris’ lawyers. Although her real estate holdings were now sufficiently valuable to cover any restitution required and more, she languished in a state of abject horror. On Sunday evening, Alice told her sister-in-law that she intended to take a sleeping powder, but in fact she took laudanum and chloroform, two drugs with which she had significant past experience. This time, the dose was too much for her weakened system, and the girl lingered until Wednesday before expiring. Her doctors stress that although it might look like a suicide, the true cause was congestion of the brain–the same organic disorder that lead her to steal in the first place.